One situation we’ve been monitoring closely (even before the recent market activity) and has only just started to become a bit dramatic: the rapidly declining inflation expectations among market participants. 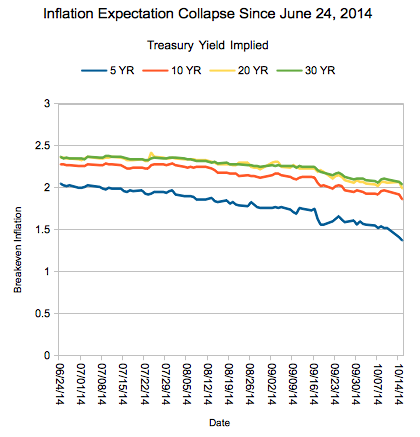 One way to follow this measure is to follow the ‘breakevens’; by subtracting real yields on inflation protected securities from treasuries, you can graph the point where the market has converged on inflation expectations. The 5-year has dropped .68 percentage points, or ~33% in 3.5 months. We have, of course, created an inflation breakeven calculator if you want to track this information easily (and graphically!). It’s noteworthy that this is coming around the same time as Fed signalling that they will raise rates in mid-2015. This might be correcting for a new inflation outlook or taking that into account as the Fed signals more and more that they will raise rates.